This is the first and short leg of Delhi tour as soon as we arrived from Dubai. We are not covering many areas this time. We shall come back after Manali trip, later, to cover the some of the several tourist spots in the Indian national capital, new Delhi. The Day One in New Delhi. At the Red Fort, Delhi. 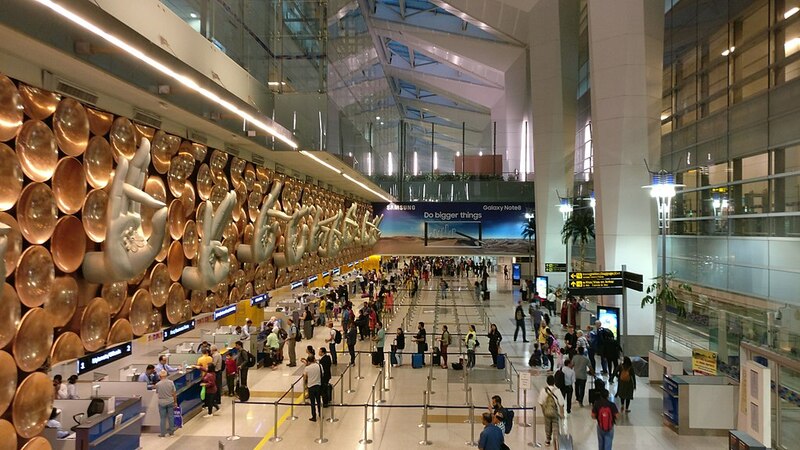 Delhi’s airport has undergone rapid changes over the last several years. The congested old Palam airport has given way to one of India’s finest and well-maintained airport. The comforts and facilities have far improved over time. Early in the morning after overnight flying we landed at Delhi to commence our multi legged India tour. The queue in the immigration was a bit long and it took some time for the clearance to be completed. We took some breakfast at the joint inside the airport and headed off outside. I wanted to travel by the Airport Express Metro to see how it felt. However, that time of the day, very early in the morning, Metro wasn’t available. Also due to the large amount of luggage that we carried at that time, we couldn’t conveniently reach the Express Metro. However, the entry to the Express Metro from just outside the airport wasn’t far away to access. We hired a taxi with a driver by the name Ranjith for the days travel, from the prepaid taxi counter outside the IGI airport. Outside the airport, there was indication of the beginning of a rain and the heat was not much due to that possibility. In June, Delhi’s climate is not so welcoming. However, it wasn’t very hot. Our next trip was off to Kalka in the evening and we had time till evening to make few visits to tourist spots in Delhi during the day.y. Since there was a lot of ground to cover in Delhi as far as tourist spots were concerned, it was planned to take up a few places, on the arrival day. The visits that can be quickly completed by the evening, prior to the trip to Kalka for boarding the next early mornings toy Train to Shimla, were decided. Qutub Minar is one visit Delhi tourists can’t ignore. “The Qutub Minar, also spelled as Qutab Minar, or Qutb Minar, is the tallest minaret in the world made up of bricks. The minaret forms a part of the Qutab complex, a UNESCO World Heritage Site in the Mehrauli area of Delhi, India” – Wikipedia. There was a drizzling rain as we reached the site. You need a ticket to enter the premises. A very few tourists were present as it was early in the morning. The minaret can’t be scaled as that was stopped several years before. You just go around the complex after a security check to see and marvel in the architecture that was completed hundreds of years ago. It takes approximately an hour to complete the visit around the complex. We hired a guide not so much to learn the intricate details of the history and architecture. However, while children can compare what they already seem to know through the history classes, it will also help someone who is doing the work of a guide to earn a livelihood. Complex seemed to pack a few stray dogs early in that morning. One of those dogs started accompanying our small group, terrifying Gayathri and Nandan. It was a Friday very early morning and a working day in India. Probably due to that reason, there were not many tourists around. Children were discussing what they learned in the history books and they were in awe seeing the real monument. Part of the complex’s buildings are in a dilapidated state. Even at that state it had a refreshing beauty. How such a complex architectural work has been completed so long back when the modern engineering, transportation, and logistics, were not available is a wonder and it is awe inspiring. One of Delhi’s landmark monument, we left the premises after spending about one hour seeing around the complex, children listening to the guide and learning from history of how, who, and when Qutub Minar was built, and after some photography. 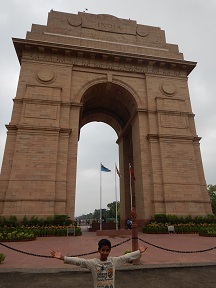 After visiting the Qutub Minar, we headed for the India Gate which was the next closest major tourist spot. “The India Gate (originally called the All India War Memorial) is a war memorial located astride the Rajpath, on the eastern edge of the “ceremonial axis” of New Delhi, India, formerly called Kingsway.” – Wikipedia. Where 13,300 of our service men’s names are engraved, where 70,000 of our soldiers who served for British India’s Army died are commemorated, this is a war memorial where the prime minister of India pays respects every republic day. Amar Jawan Jyoti, or the flame of the immortal soldier is also part of the India Gate. Wreaths are placed at the Amar Jawan Jyoti on the 26th January, by the Prime Minister of India. While we were on visit, there was a good number of visitors from mainly North India at the site. There was also some civil work going on close to the area housing the India gate. This imposing edifice is part of India’s history. If you want to know more about India Gate and what the imposing structure stands for kindly visit the below Wikipedia page. After leaving the India Gate, we headed for Carol Bagh area where I have already identified a Cargo company to transport the packages. As already mentioned, next in the travel menu was to send many large luggage’s to my home town of Kerala. We were off to Carol Bagh area of Delhi while for the children it was an enchanting new experience going around the capital city. Earlier, as I stated, we hired a prepaid taxi from the Delhi airport and kept the taxi with us for all the days travel as we were going from one place to the other in quick succession. The drivers name was Ranjith and he was a very nice person, from nearby state of Haryana. With up to ten large bags and some boxes to carry, it was impossible for our free movement when the luggage’s were around. It was already planned to courier majority of the luggage to Kerala once we reach Delhi. 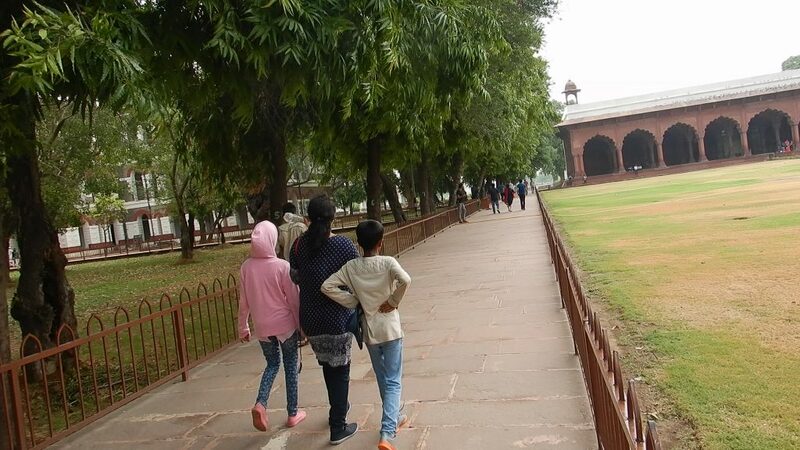 After the India Gate visit and sending the packages, we went off to Red Fort which was our last destination for the day in Delhi after which we planned a lunch and off to the Railway station to catch the evening train to Kalka heading to Shimla. “It was the main residence of the emperors of the Mughal dynasty for nearly 200 years, until 1856.” – Wikipedia. Red Fort is a very large fort in the center of New Delhi. You need to plan to spend at least two to three hours inside the fort to properly see it. The complex is in the heart of Delhi close to Chandni Chowk market. There seems to be work going in many tourist places in Delhi when we were on visit. It is always good to see improvements especially at places which are national treasure and a celebrated tourist spot. Red Fort was at the center of the political developments at the time of Mughals who ruled India during 16th and 17th centuries. “In addition to accommodating the emperors and their households, it was the ceremonial and political center of the Mughal state and the setting for events critically impacting the region” – Wikipedia. The Red Fort was constructed by Mughal Emperor Shah Jahan. “Every year on the Independence day of India (15 August), the Prime Minister hoists the Indian “tricolour flag” at the main gate of the fort and delivers a nationally broadcast speech from its ramparts.– Wikipedia. 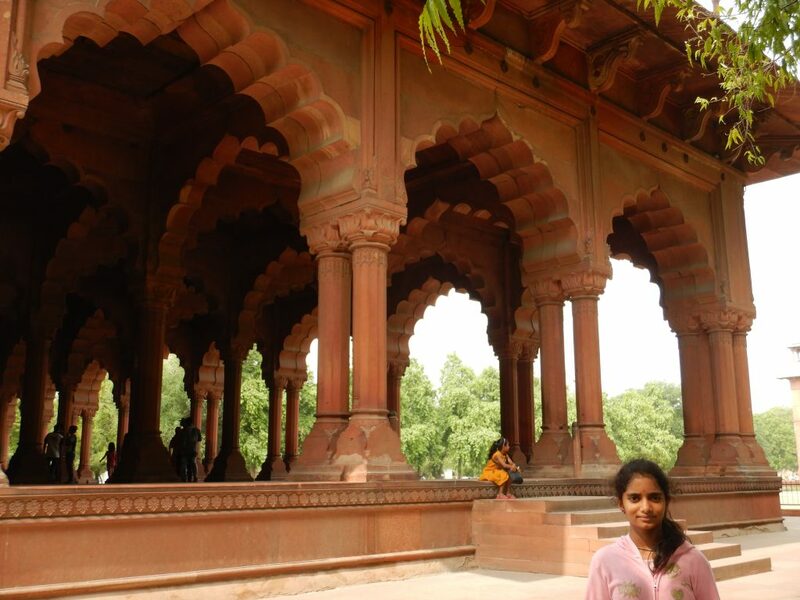 Once you enter the Red Fort, you have many structures to see inside the complex. On the way inside, there are also many shops on both sides of the way selling fancy goods and handcraft materials. We had to take a long walk around the complex to make an entry because one of the Red Forts gates was under some renovation. By that time, unlike when we were in Qutub Minar, it begun to get hot in Delhi. The heat is not very conducive when you are elated and on tour. Children quickly started feeling tired due to the heat and even I was very uncomfortable. If there are two things I must humbly advice any would-be tourist, that would be the following. Travel when the climate is good! – In my case, it is when it is cold, real cold. 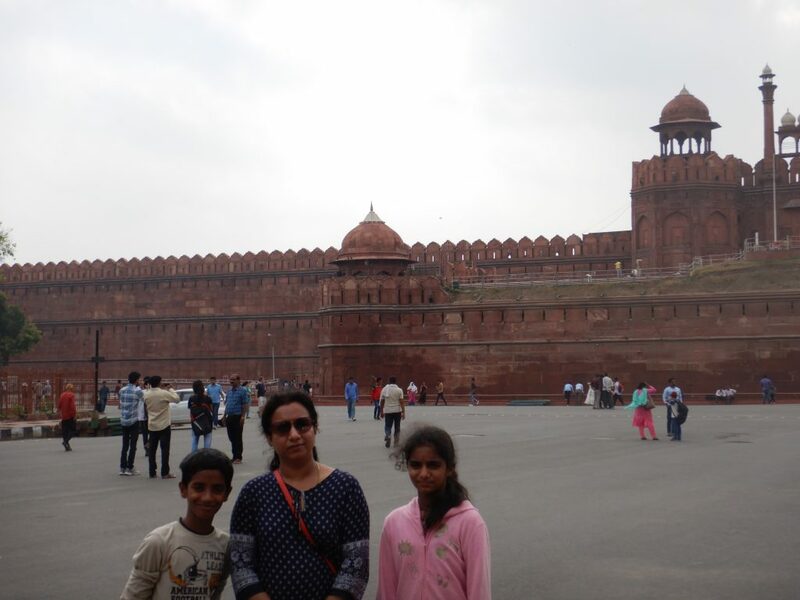 I was at the Red Fort for the first time when the climate was not cold. Added to that we had not much time to stay at the Red Fort and the walk was very tiring, the tourists in all of us were getting a little weary. We must have spent another hour seeing the Red fort and then left the premises. Red fort is a must visit for any aspiring India traveler. It is an example of how magnificent Mughal architecture can be and how extravagant and vast their fortresses can be. If you want to see in peace and explore in detail, plan to spend at least three hours inside the complex. In the evenings, the Red Fort has a light and sound show. Please get the details and plan your visit accordingly.